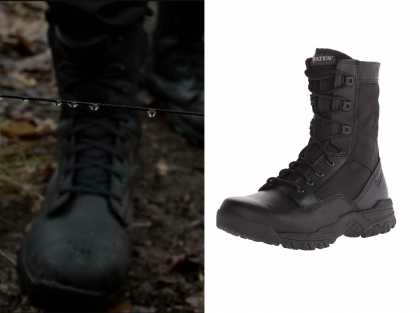 Frank Castle (Jon Bernthal) wears these black leather boots in this episode of Marvel’s Punisher. I’d love to know what or where to buy the top that the dr (Floriana Lima) wears. It’s a white too with lace/crochet top. High collar buttoned. So beautiful. Episode 2 I think. Would you happen to know where to find the blouse Karen Page wore on season 2, episode 11 of The Punisher?